'Working in Asia I miss a lot of the kids weekend sports. Its the worst thing about working abroad'. But Today I woke up on Saturday morning back in my home town. I got the kids ready, took my daughter to netball and the boys to footy. While sport in Asia is all about travelling, trekking and social football and cricket matches with transient friends, sport in Australia is about families, communities and basically passing on what we know to our kids. 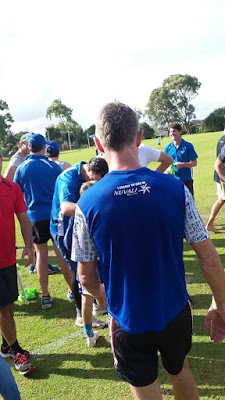 Just so happens I timed this visit with the annual 'Dads match'... A great excuse to pack the boots and have a run after the Auskick games are over and the kids asking for money for the sausage sizzle. What a great day. A great Saturday. Levi is a spark in the forward line. Sunday was more of the same with an early start in for a soccer match I was looking forward to more than any cup final or world cup fixture. Wemley Downs 11s vs Joonadulp. The Team lost 3 -2 , but it was a great game against a top side and I got to see Shay score!